1. 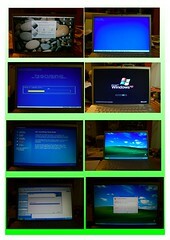 Network Administrators set up unattended installations. Network Administrators use a program named Setup Manager to set up answers to questions that are asked during Windows Installation setup. This is done in a text file called an answer file which Windows XP Setup uses to pull common information for the installation. A UDF file is also created along with the answer file. The uniqueness database file answers questions that are unique to each computer, such as the computer name. a. Answer file answers certain questions, mainly a babysitter file. b. UDF is a uniqueness database file. The UDF overrides the answer file. It is for the specific computer. You can have one answer file and many UDFs. 2. Imaging. There are 3rd party tools, such as Ghost or Altaris that can make an electronic image of the computer. They take a picture and then they can reproduce the picture somewhere else. The Network Administrators set that up. 3. RIS. Remote Installation Server. Create an image on a RIS server and an automated installation can be done to the computer through the network. An RIS client connects to the RIS server and downloads the computer specific image. Network Administrators set that up. Computers that have a Preboot Execution Environment (PXE) compliant network adapter, you can start the computer from a server on the network to begin the Windows XP Installation automatically. Computers that do not have a PXE compliant network adapter must be started with a RIS disk file supplied by the network administrator. The RIS disk file contains the necessary drivers and emulates the PXE environment, so the installation can continue automatically.